“The Thirty-nine steps” is a spy novel written by John Buchan and published by William Blackwood and sons in 1915, after first appearing as a serial in Blackwood's. Although the novel is published a year into World War One, the action predates the outbreak of the war by a few weeks. 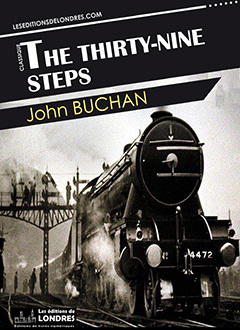 “The Thirty-nine steps” was a major success when it was first published, creating a hero, Richard Hannay, who will appear in seven novels in total, and it is without doubt the most famous work by John Buchan. However “The Thirty-Nine steps” without doubt owes its long enduring popularity to the first cinematographic adaptation by Alfred Hitchcock. Still, Buchan's novel remains one of the great British adventure novels and is still considered by the roman noir experts as one of the greatest spy novels ever. It probably invented the genre. Richard Hannay is bored. Just returned from Rhodesia, he tries to adapt to life in London. One night, a man calls on Hannay at his flat and asks to speak to him. The man, Scudder, an American, tells Hannay an incredible story: there is a general conspiracy aimed at overthrowing the old order. More precisely, there is a plot to assassinate the Greek Premier, Karolides. Scudder is very worried. He is followed, but he managed to escape his pursuers by faking his own death. Still, the spies who are after him eventually catch up with him. One night, Hannay finds Scudder “skewered” to the floor in his own apartment. Hannay thinks long and hard, but caught between a rock and hard place, between the police who will not believe he is innocent of this crime, and the spies who killed Scudder and will want to kill him, he chooses to flee. He waits all night for the milkman to show up, and then borrows his coat and hat, manages to get to Saint Pancras and takes a train to Scotland. He gets off near Galloway in Scotland, walks in the midst of the countryside and notices he is observed by a monoplane. He first finds refuge in a shepherd's cottage and takes another train east. He finds an inn and stays for the night, then finds out his pursuers are onto him. He convinces the innkeeper to call the police and manages to escape in a car. He reads Scudder's pocket book that he had taken with him when fleeing his apartment, cracks the code and understands the plot is not about killing Karolides, but probably about something much bigger. There is mention of a potential invasion of Britain by Germany, of the Black Stone, and some mysterious Thirty-Nine steps. Hannay is then pursued by an aeroplane; when attempting to flee he has a car accident. He is rescued by a liberal politician who asks him a peculiar favour: he needs him to deliver a speech in his place. Hannay improvises a speech about Australia. The politician, Sir Harry, writes a letter of introduction allowing Hannay to tell his story to the Foreign office. He then leaves, is spotted again by the aeroplane and sees three men looking for him. When he finds a roadmender in the middle of the moor, he trades places with him, does the same with a passing motorist and escapes again. He later finds refuge in the house of the one mentioned by Scudder as “a man who hoods his eyes like an owl”, his archenemy. The man and his accomplices get the better of him and put him in a room, where fortunately he finds bomb-making material with which he blows up the place, using lentonite. Injured, he hides at the roadmender's place, then goes back to England and meets Sir Harry's friend, Sir Walter Bullivant, at the Foreign Office. Hannay easily manages to convince him he is not guilty as Sir Walter had previously received a letter from Scudder just before his death. They then learn Karolides has been shot. Hannay later arrives at a house where Sir Walter is having a secret meeting with key Government and military officials. Coincidentally, he recognises a man leaving the room and interrupts the meeting when he realises the man is impersonating the First Lord of the Admiralty, Lord Alloa. He explains his story to the meeting participants, and then understands that the Thirty-nine steps must refer to a place, probably on the English Coast, “between the Wash and the Channel”, from which the German spies will embark. He identifies the place in Kent, goes there and with police help he catches the men. Three weeks later, the war starts. John Buchan's intention is clearly stated from the onset: create a “dime-novel”, “where the incidents defy the probabilities”. The dime-novel, or shocker (penny dreadful or shilling shocker), as supposedly the British call it, had a history. Created in 1860 by publishers Erastus and Irwin Beadle, the dime-novels were a series of inexpensive paperbacks called Beadle's dime novels. The material used in the dime-novels was usually first serialised in the weekly story papers, magazine supplements which were very popular at the time. They can be considered the ancestors of pulp magazines and hard-boiled crime novels of the Twenties and Thirties. In the late Nineteenth century, dime-novels were mostly adventure short novels dealing with frontier stories, rather than hard-boiled romans noirs. It is towards the 1880s that the subjects and themes diverted from western and frontier topics and that the first detectives or sleuths were introduced. The move towards urban crime stories reflected the rural-urban shift taking place in the United States at the same time with accelerated industrialisation in the immediate aftermath of the Civil War. Hannay predates many of the later British heroes such as James Bond, Simon Templar, Harry Palmer, Alec Leamas, George Smiley, who tend to become darker and more complex as the times become more complex, mature and dark themselves, and as the general mood in the Islands move from conquering British-ness and Imperial pride to self-doubt and secret Cold War plots. Still, Hannay's immediate followers, Bull-dog Drummond and The Toff were probably closer to the Buchan character. Hannay is a major-general who has spent time in Rhodesia and South Africa. He took part in the Matabele wars, and was a spy during the Second Boer War. The predecessor of more complex fictional characters, Hannay was a typical Scot of the Empire: tough, honest, outspoken, hard, but with a bit of an English stiff upper lip. Buchan apparently created Hannay after Edmund Ironside, a Scottish spy during the second Boer war. Hannay sometimes surprises us with life remarks and social ones, portraying a time where the middle class was not so dominant, where aspirations pushed readers towards the secretive ambiances and eccentric behaviours of the upper classes, and the adventurous and generous values of the working class, builders of the Empire, where being a man meant rejecting the safety of comfort for the thrill of real-life action: “A man of my sort, who has travelled about the world in rough places, gets on perfectly well with two classes, what you may call the upper and the lower. He understands them and they understand him. I was at home with herds and tramps and roadmen, and I was sufficiently at my ease with people like Sir Walter and the men I had met the night before. I can't explain why, but it is a fact. But what fellows like me don't understand is the great comfortable, satisfied middle-class world, the folk that live in villas and suburbs. He doesn't know how they look at things, he doesn't understand their conventions, and he is as shy of them as of a black mamba.”. We find this is probably one of the best Hannay-defining paragraphs. Without underestimating the success of Buchan's novel upon its release, it is Alfred Hitchcock's 1935 movie, starring Robert Donat and Madeleine Caroll which have propelled the title and story to worldwide fame. Still ranked as one of the 100 greatest British movies, The 39 steps differs significantly from the book original. The main differences are in a more obvious diversity of scenes, with more memorable characters, some thrilling scenes such as the Flying Scotsman's, the chase in the midst of the Scottish night and, as always with Hitchcock, some interesting eroticism (stockings scene in the inn, rain dripping on Madeleine Carroll...), and the great music-hall scenes which introduce and end the movie, all interesting variations typical of Hitchcock's cinematography. There will be more movies. Even if none will match Hitchcock's original. The second one is Ralph Thomas's 1959 remake of the Hitchcock original. And the third one is Don Sharp's 1978 movie, an interesting one and a bit closer to the book original. And, although we don't believe Hitchcock ever mentioned it, we have to believe he was inspired by the aeroplane chase in the book for the cropduster scene in North by Northwest.